The Flight has a hollow-ground blade manufactured using 8Cr13MoV stainless steel, which is similar to AUS-8 in its properties, performance and function. 8Cr13MoV steel contains both molybdenum and vanadium. Molybdenum enhances the strength and hardness of the steel, vanadium its wear resistance and toughness. Carbon augments the steel’s tensile strength and increases its resistance to wear and abrasion. Resulting from this recipe is blade steel that retains a sharp cutting edge over time and use. Most byrds are available with a plain or combination plain/serrated cutting edge. The “comet” shaped opening hole is a trademark of the byrd line and is synonymous with the stringent quality requirements, high performance materials and manufacturing, which go into every knife. fully stainless handles have a sequence of ergonomic curves that fit into the palm for comfort and fatigue-free control while cutting. For additional safety, a portion of the lock release is ground away. This is a design add-on conceived by custom knifemaker David Boye and eliminates the chance of gripping the knife tightly enough to unintentionally release the lock. 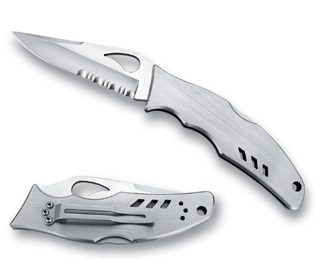 All byrds feature a pocket clip that clips the knife inside a pocket and it attaches to either end of the folder for tip-up or tip-down right-hand carry.